Since its launch ten years ago, LinkedIn has grown from a social hub for job seekers to a go-to site for executives, recruiters and companies. However, despite the site’s rapid growth – more than two members join every second – many businesses and employed individuals are wary of the professional network, which is often misunderstood as a site primarily for job seekers. There are a number of “LinkedIn Myths” that perpetuate common misunderstandings regarding LinkedIn’s purpose. Despite these myths, the site is important for both companies and individuals – regardless of whether or not they are actively seeking employment. One of the most common reasons businesses fail to obtain a company LinkedIn profile is simple: they don’t believe it will be beneficial to them. This notion corresponds with the idea that LinkedIn is only useful for those seeking employment (see below), and will, therefore, have no impact on a company. In reality, a LinkedIn company profile is a must for businesses looking to gain credibility among customers and potential clients. According to LinkedIn statistics, every Fortune 500 company is represented on the site, and approximately 3 million businesses have LinkedIn pages. Having a strong profile on LinkedIn helps businesses establish credibility and authority, and allows businesses to share company news and information on a major, international platform. Additionally, a strong, optimized LinkedIn profile ranks highly in Google results, increasing a company’s visibility. Another common myth believed by businesses is that they don’t need a company LinkedIn account because they already have a company Facebook, Google+ or Twitter account. In reality, LinkedIn may be the most important social network for your business – primarily because it actually isn’t a “social network” in the way the others are. LinkedIn is the only network that is completely dedicated to professionalism. Like Facebook, Twitter and Google Plus, LinkedIn is populated by both company profiles and personal profiles; however, unlike the other social media sites, where profiles are made for sharing – or oversharing – pictures and statuses pertaining to member’s personal lives, LinkedIn is completely dedicated to building professional networks and engaging with professional connections, making it a more important social site for businesses than the others. A common reason businesses are reluctant to start a company profile is the fear that competitors will attempt to steal business away from them. While it’s true that competing businesses are able to see a company’s connections, this fear is largely unfounded. Although competitors may try to leverage LinkedIn connections for information, it’s unlikely that well-built relationships with clients will be broken by one sales call from a competitor. Additionally, having a large number of connections with high-profile clients in the industry will demonstrate to potential customers that the business is a source of authority, a positive outcome which outweighs the small chance of losing business to competitors. The idea that profiles are only for active job seekers is the most common misconception and most widely perpetrated myth about the site. While it’s true that LinkedIn got its start as a kind of online job fair, the company has since grown to include a wide range of people, both employed and currently seeking work. A personal LinkedIn page is important for business owners because potential clients will often check out personal profiles as well as company ones. A comprehensive LinkedIn page will give a business owner credibility, which is then extended to their company. 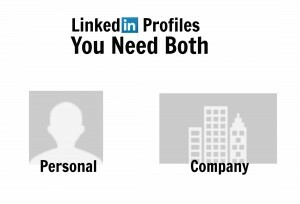 Similarly, a LinkedIn profile is important for employed individuals, because it allows them to control the information found about them, increases their visibility among their network, and allows them to build upon their personal brand. The notion that LinkedIn is only for recent graduates goes hand-in-hand with the idea that the site is primarily for job seekers. While it’s true that LinkedIn attracts recent grads looking for work, the site also contains a large number of profiles of those higher up on the corporate ladder. In fact, CNN reported in 2010 that the average member of LinkedIn is 43 years old, has a college degree and is making over $100,000 a year. Additionally, more than a quarter of LinkedIn’s members are executives, making it an ideal spot for networking. The bottom line is that LinkedIn is an important tool, both for companies and individuals. Company LinkedIn pages help businesses gain credibility and allow businesses to position themselves as a source of authority within their industry. It also helps businesses connect with potential customers, share company news on a large scale, and increase their visibility and ranking within Google. Personal profiles also allow individuals and business owners to network, control what recruiters and clients find about them, and add to their personal brand. If you’d like to discuss, in more detail, how LinkedIn should be included in your social media marketing mix, please contact us.